This Irish bell features a leprechaun sitting on his pot 'o gold along with shamrocks on the skirt. This ceramic Irish bell features a leprechaun sitting on his pot 'o gold as the handle and it is enhanced with green shamrocks on the skirt. 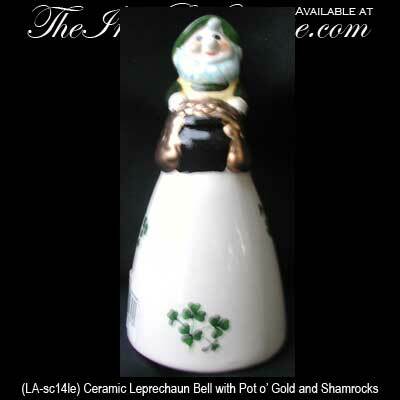 The leprechaun bell is suitable as a humorous version of the Irish make up bell and it measures 5 1/2" tall x 2 1/2" wide. The hand painted leprechaun bell is made in Ireland by Liffey Artefacts and it is gift boxed with shamrock and Irish bell history cards, complements of The Irish Gift House.